A restaurant’s cleanliness speaks volumes to its customers, the minute they walk through the door. The hint of unsettling smells, coming from even a mildly unclean kitchen, can prompt a customer to walk in one door only to leave out the other. Even something as mildly offensive as sucker wrappers left on the counter top or dribbles of a salad splashed on a floor can send guests scurrying. Safe to say, an experienced restaurant cleaning service is just the ticket to keep things clean and humming along. Restaurant cleaning can be very rewarding, as it contributes to the overall guest experience and the health of everyone involved. It can also be a complicated task, since there are so many areas to clean and maintain. When it comes to restaurant cleaning, getting and staying organized is important. The easiest way to do this is to make two lists: one for supplies, the other for best cleaning practices. A list of supplies should include a reliable vacuum, broom, floor buffer, scrub buckets, cleaning brushes and clothes, trash bags, disinfectants, bleach, and a mop. Besides a list of supplies, a list of restaurant cleaning best practices is essential for any successful cleaning company. The list should cover the best way to thoroughly clean the restaurant’s entryway, dining area, public restroom and kitchen. When doing restaurant cleaning, use a disinfectant solution in these areas, the disinfectant needs to be strong enough to kill germs yet safe enough for a restaurant environment. Read the labels to make certain they’re appropriate for a restaurant then wipe down all surfaces including chairs, countertops and other furniture in the host and waiting areas. Follow along with a rinse and a drying cloth for wood furniture. Menus are often neglected in the dining area, so make sure to disinfect and replace pages that are stained or torn. Using the disinfectant, clean tables, table pedestals, chairs and bench seats. Rinse and wipe dry. In both areas, take extra care to disinfect light switches, door handles, and the like, anywhere that germs collect. Clean lighting fixtures, dust window sills and knick-knacks, vacuum carpets and sweep, mop and rinse tile and vinyl floors. Clean mirrors and widows with a vinegar solution to cut down on germs and to leave behind a shine. 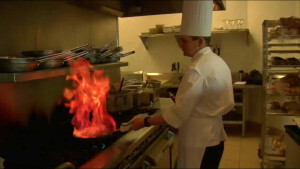 The restaurant’s kitchen staff is responsible for pots, pans, dishes and general kitchen clean up. The restaurant cleaning company comes in after the restaurant closes to disinfect the countertops, sinks and floors using the same safe, disinfectant practices employed in the entryway and dining area, taking extra precaution to thoroughly rinse and dry all areas that come in contact with food. Restaurant bathrooms get a lot of guest traffic during the day and so need extra care. Spray bathroom services with a strong disinfectant solution and allow to sit at least five minutes to kill stubborn germs. Scrub sinks and toilets, changing brushes and cleaning cloths frequently to avoid cross-contamination. Disinfect light switches, stall walls, paper towel and soap dispensers. Sweep, mop and rinse floors. And when starting a restaurant cleaning business, consider a Jani-King franchise. Jani-King is the industry leader in commercial and janitorial cleaning services. Its franchisees enjoy unequaled support in starting a cleaning business which includes helping to secure clients and perfecting best cleaning practices. Jani-King is the world’s largest commercial cleaning franchise company with more than 12,000 franchises in 20 different countries.